Make no mistake. The fight against global warming is a full-fledged war, with strong armies poised for battle on either side. There are minor skirmishes and engagements, attacks and counter-attacks, strategies and counter-strategies, deceptions, victories and defeats. But above all, there is the fog of war - the cloud of disinformation that makes real success difficult for anyone. On one side of the battle, there are large numbers of environmentalists, mainstream scientists, engineers and climatologists. They are supported by most of the media, many celebrities, some politicians, laypersons and, surprisingly, quite a few civil servants. Opposing them are the oil producers, automakers, processing industries, and other big businesses that want to preserve the status quo for as long as they can, to maintain their profitability. This group can, rightly, be called the global warmers. They have the money and the power, and they can easily buy into the political system. But right now, the global warmers are on the run, facing a major onslaught from the environmental groups, and their tactics are getting increasingly defensive. Their first line of defense is to deny the very fact of global warming. Generously funded “think tanks” produce reports that question the very accuracy of the statistical data that supports the notion of global warming. 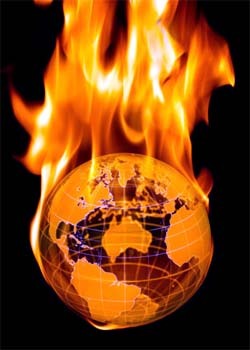 However, this position is getting less defensible as signs of global warming are now unmistakable- the break-up of the polar ice caps, the melting of glaciers and the drying up of lakes and rivers throughout the world. The second line of defense is to deny that human beings are responsible for global warming. This again is done in reports that question the science behind the climate change models. They point out that different computer models produce different results and there is no absolute proof that human activity causes global warming. But this argument, too, is wearing thin, as more people realize that environmental pollution cannot possibly be good for the planet – it will definitely have harmful effects, most probably in the form of global warming. The next defense -indeed a very successful one - is to steal the thunder from the opposition, by using their terminology. This gives the appearance of action when there is none, or very little. Thus every business uses words like energy efficiency, or sustainability. Any new product or service that comes out is “green”. We have green power, green politics, green communities, and green meetings. Yet another tactic is simple diversion- moving the focus away from the issues that matter to others that have a lesser impact. Most of the environmental damage today is caused by air and water pollution from industrial sources, industrial wastes, emissions from commercial vehicles, burning of fossil fuels, depletion of natural resources, and energy consumption in large buildings. But public attention is, instead, directed towards voluntary energy savings, mostly at the individual level. We are encouraged to re-cycle more, use energy efficient light bulbs, use renewable energy, and generally reduce our environmental footprint. All these things are important but it is doubtful how much impact they will have in the absence of any real enforcement. Much more needs to be done -- tightening up of regulations, more commuter trains, less buses, and reduced dependence on fossil fuels. In addition, we need stronger incentive programs to induce people to make better environmental choices. In the long run, the global warmers cannot prevail, because the consequences would be far too disastrous. But we need action right now, before climate change becomes irreversible.